How to limit phone time in order to have a happier life. In a world where we are constantly attached to our phones, I am challenging us to let go of our phones. When we do this, we will be free. Enter a truckload of guilt pouring over my already weary self. “I am such a bad mom,” the lies whisper to me. 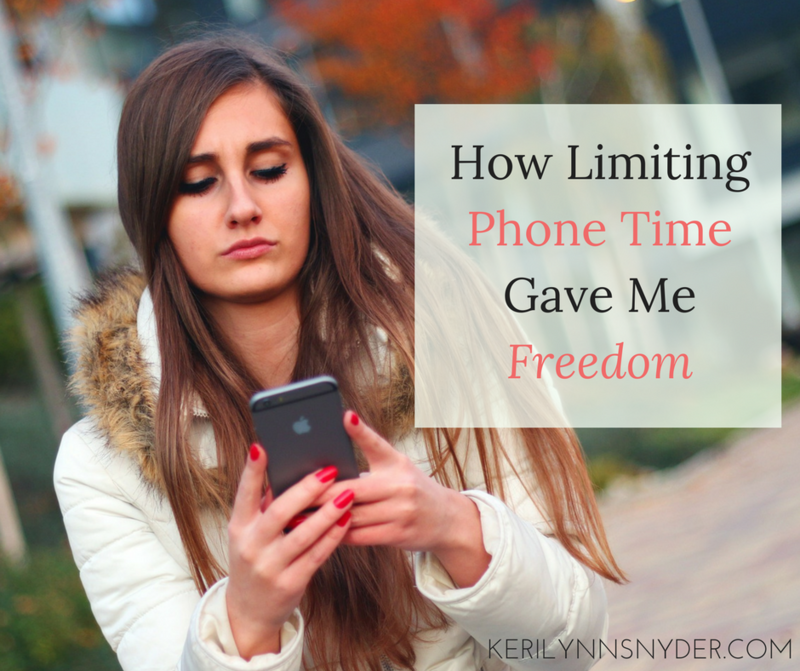 With a sigh, I put down the phone and promise myself that I am going to start limiting phone time. With a hopeful heart, I start limiting phone time. Nevertheless, a few days later, I am right back where I started, justifying with little, “I get it but…” statements as to why I need to be on my phone. The kids never give me a moment to myself. Sometimes I just need to escape the chaos of the present moment. Sadly, all these excuses did were prove to my weary soul more then ever the need to put down the phone. That little glowing rectangle had a greater hold on my life than I ever realized before. Many times, I think when we read the articles about putting down our phones or having less screen time, the guilt overwhelms us. 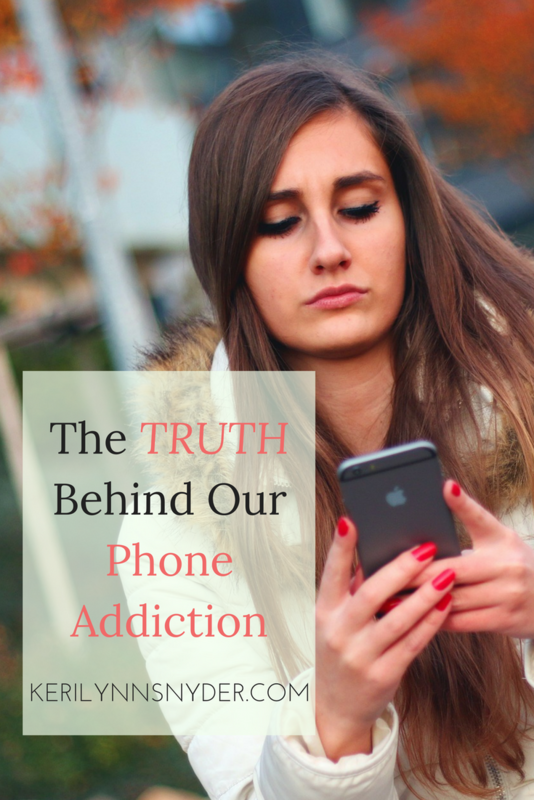 We put down our phones for a few days because we feel like we are bad moms if we look at our phones. Guilt consumes but eventually old habits creep back in, just as they did with me. Those little trusted devices find themselves in our clutches again, screens glowing, fingers scrolling. And then we see another article and feel the guilt. It is an endless cycle. As I have thought more and more about this, I have realized something. I am not a bad mom because I look at my phone. The problem lies in the reasons why I am going to my phone. The majority of the time, the mindless scrolling was an empty effort to escape. I cringe as I write this, because of the ugly selfish truth that it is? However, I do not think I am alone in this. We scroll to escape the screaming toddler, the mounds of laundry, the unfulfilling job, the struggling marriage, the pile of bills. We scroll to escape reality. When I realized what was at the root of it all, I shrunk back from my phone. My phone had become my escape and that was never what I intended it to become, so I knew it was time for some serious changes. Changes for real, not just changes out of guilt but changes out of healing myself. So how do we go about truly changing and healing? It is good and healthy to have limits on things. We teach our kids to practice self-control, which is exactly what we need to do with phones. This is going to look differently for everyone. To give you some ideas, here is what I decided to do. Anytime I get on my phone, I ask myself, “Why am I getting on here?” This has helped me to be intentional with my time. As a blogger, social media is an important part of my influence, so setting specific times to be on Instagram or Facebook has been helpful. If I am escaping to my phone, I can seek comfort in more intentional ways. As I started to implement these changes, I realized I was rarely sitting and scrolling on my phone. Instead, I was picking up a book to read, messaging a friend to check on them, playing with my kids, closing my eyes as the sun warmed my face. At times I even do get on to scroll, but with the right heart- not out of a need to escape reality. Don’t get me wrong, there are still moments when my fingers feel that desire to scroll mindlessly, and sometimes I do, but I am more aware of it all and able to redirect myself. Mamas, I know mothering is hard. We are not just moms. We wear many hats and handle countless situations every day. It is normal to want to escape and have a moment to ourselves. The question lies in, where do you want to be escaping to? Wouldn’t you rather make the choice that leads to freedom? What about you? Do you struggle with this? Do you also believe in limiting phone time? Share below in the comments- I would love to hear your thoughts! I’m not a mama, but this is a challenge for me every day. Learning that I don’t need my Ipod to keep me happy has been SO GOOD. i can find fulfillment and contentment in Christ in every moment, and they don’t need to include the I-pod. Social media can be a HUGE blessing, but it has from time to time become an idol in my life, and this was that sort of an ‘ouch’ and ‘amen’ post that i needed to read as a reminder for the week. May my life this week reflect more of His glory and not escaping from life. Emily, I love the words that you shared! So encouraging! Goodness, I know what you mean about it becoming an idol- all too quickly that can happen! Thank you for stopping by! Keri Lynn, I was immediately drawn to your site because of your title!! I also write on intention, so I’m sure we are kindred spirits:) I’ve also had to be more intentional on limiting phone time, and it’s crazy how freeing it truly is. It’s also so easy to slip right back into the habit, so I’ve actually begun tucking it away just to keep it out of sight. I love the idea of tucking it away to keep it out of sight! So smart! I keep mine on during the day because of the kids being at school and it is a process training myself not to respond to all the little "dings" that I hear! I do the exact same thing as a blogger, Rebekah! It is so easy to! I am definitely a work in progress with this, but the changes are helping a lot! Oh anytime my kids say, "mom put your phone down!" I just feel crushed and am instantly reminded of the importance of putting it down! These are great insights. I definetly need to put some more thought into this area. Great post! I didn’t think I was too bad with my phone, but the other night I sat down to watch a show without my phone and it felt completely weird to just focus on one thing! I am definitely going to be working on putting it down more. Such a good point that it’s not wrong to jump on social media but we need to examine our why behind it! It can be tempting to use social media as a means to “escape” and instead we can choose to be intentional with our time and self-care.